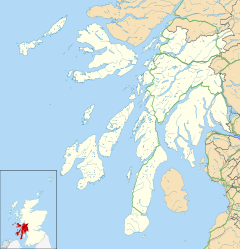 Scarinish (Scottish Gaelic: Sgairinis) is the main village on the island of Tiree, in the Inner Hebrides of Scotland. It is located on the south coast of the island, between Hynish Bay to the southwest and Gott Bay to the northeast. The harbour was built in 1771. The village has the only bank on the island (a branch of the Royal Bank of Scotland), a grocery store (the Co-op), one hotel, a Post Office. The Tiree ferry terminal is located there, with a ferry service that runs to Oban on the Scottish mainland. A ferry shelter completed in March 2003 won the RIAS Andrew Doolan Best Building in Scotland Award that year. ^ "Scarinish". The Gazetteer for Scotland. Retrieved 20 November 2017. ^ "Destinations: Tiree". Caledonian MacBrayne. Retrieved 21 March 2018. ^ "Ferry shelter wins building prize". BBC News. 23 October 2003. Retrieved 21 March 2018. This page was last edited on 26 June 2018, at 21:21 (UTC).